When a healthy seal pup was scooped off the beach by a family in an RV, The Marine Mammal Center’s rescue volunteers sprang into action, following in hot pursuit of this harbor seal hostage. Beemer Cruise is now back in the ocean, after her adventurous road trip. During her two-month stay at the Center she gained weight and learned how to eat fish on her own. Then Beemer Cruise was ready to go back home. She was released at Cypress Point on the Monterey Peninsula on June 7, along with seven other harbor seal pups. One of her rescuers, Zee Zaballos, had the honor of opening the carrier, allowing Beemer Cruise to come out and see the ocean in front of her. She made her way down to the surf line and enjoyed the salty taste of freedom as she dove into the waves. Harbor seal release at Cypress Point, from left to right: Moana Lei, Mae, Beemer Cruise, and Cleone. Harbor seal Beemer Cruise adjusts to her new temporary home at The Marine Mammal Center. “We have to get this pup out of there!” Marina Nichols said as she and Zee Zaballos hit Highway 1 on a mission to rescue a harbor seal pup that had been illegally picked up. A vacationing family had removed the seal from Garrapata Beach, south of Carmel, and was heading north in their recreational vehicle with the animal inside—meaning the pup in need of rescue was actually a moving target. As Volunteer Crew Supervisors at The Marine Mammal Center’s Monterey Bay satellite facility, Marina and Zee regularly go out on rescue missions in the Center’s rescue vehicles. But when the call came in about this pup on the run, no trucks were available and there was no time to waste. So they hopped in Marina’s BMW and hit the road in a hurry. As Marina drove, Zee was on the phone—first with a dispatcher from the local Sheriff’s department and then with the family in the RV. She persuaded them to pull off the highway at the next exit and wait for help to arrive. Zee and Marina weren’t far behind. 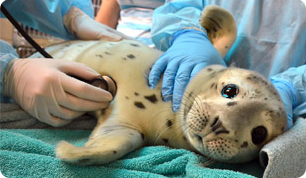 They knew that a young harbor seal pup wouldn’t survive long without its mother and would need to be treated by the Center’s veterinary experts as soon as possible. When Marina spotted the RV in a shopping center parking lot, her adrenaline—and her training as a former probation officer—really started to kick in. She drove right up to the vehicle in question, blocking the pathway forward. “It felt like ‘Starsky & Hutch!’” Zee says. Marina and Zee asked to see the seal pup and were presented with a laundry basket full of dirty laundry. Hidden under a pile of blankets was a tiny harbor seal pup with its umbilical stump still attached. They put the seal pup into a carrier in the back seat of the BMW and advised the family to wash the blankets in hot water and bleach to prevent the spread of any disease. Beemer Cruise will soon be ready to return home. The family drove off in the RV as soon as the exchange was made, but not before Marina snapped a photo of the license plate that could be shared with the NOAA Office of Law Enforcement, the agency tasked with investigating illegal interactions with marine mammals. Then she and Zee hit the road again, and within 10 minutes they had arrived at the Center’s Monterey Bay satellite facility, where the pup could be examined and begin treatment. Zee and Marina named the pup Beemer Cruise in honor of her exciting adventure. “It was the best rescue I’ve ever been part of in my eight and half years as a volunteer,” Marina says. An admit exam confirmed that Beemer Cruise was healthy and had been taken off the beach prematurely. She was bright, alert and vocal—all good signs—though without proper care from the Center, she wouldn’t be able to survive without her mother. Beemer Cruise was rescued on April 4 and since then has been rehabilitating at The Marine Mammal Center's hospital in Sausalito. After several weeks of being fed fish smoothies through a tube, Beemer Cruise has started the process of learning how to catch fish on her own. Animal care volunteers at the Center must teach young pups like Beemer Cruise how to swallow a fish whole, track prey in the water and compete with other animals. Although the family that picked up Beemer Cruise was likely well-meaning, their actions were illegal and prevented a healthy pup from growing up in the wild with its mother. While a pup’s signature “mah! mah!” cries may sound like a call for help, it’s never a good idea to interfere. Harbor seal mothers often leave their pups on the beach while they forage nearby. However, any human interaction—even getting too close—could cause a mother seal to abandon her pup. That’s why we stress the importance of keeping your distance. The best thing to do is to leave seals be. If you see a marine mammal that you suspect is sick, injured or orphaned, call The Marine Mammal Center at 415-289-SEAL (7325). Luckily for Beemer Cruise—and thanks to Zee and Marina—she is in good hands now, and with the help of our dedicated staff and volunteers, she’s getting a second chance at life. You can help Beemer Cruise get back to the ocean where she belongs! Consider making a donation to The Marine Mammal Center to help us feed and care for all of our pinniped patients in need. Find out more about our Leave Seals Be campaign. Learn about Pacific harbor seals! Help us feed our pups by donating to the Dollar-a-Pound Campaign.